BPA participated in a U.S. Department of State survey of the historical U.S. Consulate Compound in Leipzig, Germany in order to perform a security enhancement study for the existing buildings and the compound perimeter. 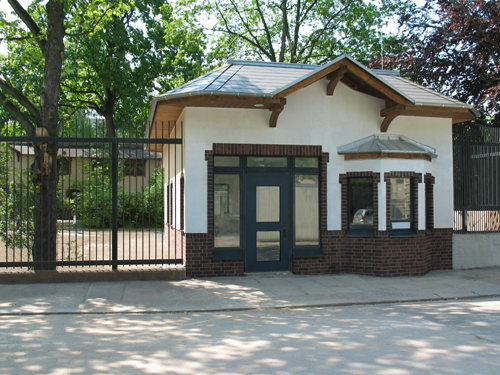 The security upgrade included enhancement of the existing doors and windows, new alarm and monitoring equipment, new perimeter walls, fences, and gates, new anti-ram barriers, and the design and construction of a new compound access control (CAC) building. The new CAC building monitors and controls both pedestrian and vehicular traffic onto the compound, while also providing an entrance lobby with x-ray machine and walk-through metal detector for screening all visitors. The design of the new CAC building is in keeping with the style architecture of the existing service buildings located around the Consulate building, preserving and respecting the beauty and historic significance of the site.